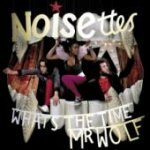 Getting a spot in the start-of-year lists of acts to watch must be a great way to kick off 2007 for Noisettes. But then, what happens when at the end of the year, rather than wrestling with armfuls of awards, you've had one number 38, your album is languishing manifold in the bargain bins around the country, and your bandmates are working in Blockbuster to pay off debt to the record company who won't go near your new material even with a radiation suit? The hotly tipped London trio, having toured with the likes of Bloc Party and Muse in the past 12 months, this year, run that gauntlet. Opener Don't Give Up, launches a statement of intent, bassist vocalist Shingai Shoniwa, in equal parts screams and purrs over the trios scorching riffs and relentless drums. So far so good. Their combination of rock, indie, metal, and occasional nod to jazz and torch singing make for busy listening. Tracks like Scratch Your Name, Sister Rosetta, and Bridge to Canada lean more towards rock, whereas Nothing to Dread and Hierarchy fall from an indie tree. But it's all in your face and high octane. Full of swagger and bravado, What's the time Mister Wolf, pulls you along by your skinny tie from start to finish on first listen, and must make for a pretty good support set while you buy beers and jostle into place for the main attraction. But on subsequent listening, it falls down. Pounding drums begin to thud. Shoniwa's vocals, at first visceral and sensuous, turn simply shouty and squeaky. Songs blur into one. It is an album of diminishing returns. At times the clash of metal, indie, and jazz vocals resemble a motorway pile up-but not a spectacular one, more one where the drivers get out and immediately start swapping insurance details. The Noisettes wear their influences in plain view, while they don't necessarily sound much like any one thing, it all sounds like something. Like magpies they've swept through their record collections, picking the shiniest motifs from the XFM playlist of the past few years to create something ersatz, fleeting, and lacking in substance. Leatherette rather than Ronnettes. There are things to like about the album. The mostly acoustic The Count of Monte Christo hints at a greater diversity in their talents than the rest of the album, and IWE is a scalding indie track with danceability and depth. But overall, the much vaunted revolutionary sound and sultry vocals we have been promised aren't there. This is another standard British guitar band riding in on the tails of a very successful era for the music. I am willing to stick my neck out here and say that, come the end of the year, The Noisettes will not have made the splash many pundits have suggested they might. Although with a stateside tour with TV On The Radio, I may be proven wrong; if I am it'll be a victory of style over substance. What's the Time Mr Wolf is a workmanlike, enjoyable enough effort, suitable for sparing background listening. Packed full of calories but lacking much flavour, fast becomes bland.